These kitchen gadgets are fun for children and maybe adults alike. 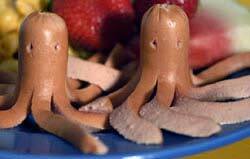 Called the Octodog, they can brighten up any kids’ meal or barbeque, making little Octodog-shaped hot dogs. Take your hot dog, Frankfurter or Wiener, or whatever you want to call it and simply press it into the Octodog and press down and you have the curiously shaped little hotdogs seen on the right hand picture. If you go the Octodog web site, there are more details as well as a video and even some serving suggestions. One thing worries me though. 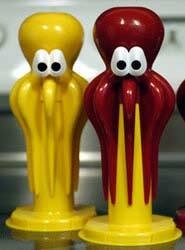 Do you do this after they are cooked or before; it’s not clear from the Octodog manufacturer’s website? I think you probably have to insert them when they are hot though, so be careful!! Another thing that concerns me is that our children will want to eat nothing but a diet of nothing but processed “sausage-like” material for a few weeks at least, so you may have to hide them away from time to time! The Octodogs cost $15 each, but I think that’s a small price to pay for these cool looking gizmos, and I’m sure your kids will love them. You do it before you cook it, that way the legs (tentacles) can curl up like an octopus. This would be really cool around the campfire! A nice, easy alternative to “Spider sausages” The legs curl as they cook over the fire and also adds more of that “wood burned” flavor.